Whatever your feelings are about god turtles, know that the Yangtze soft-shell turtle, or Rafetus swinhoei, is definitely real. Just very rare. But this year, their known population in Vietnam suddenly doubled. Which brings their population… to two. Giant soft-shell turtles have played a part of Vietnam for a couple millenia, as the legend of Kim Qui, the Golden Turtle God. 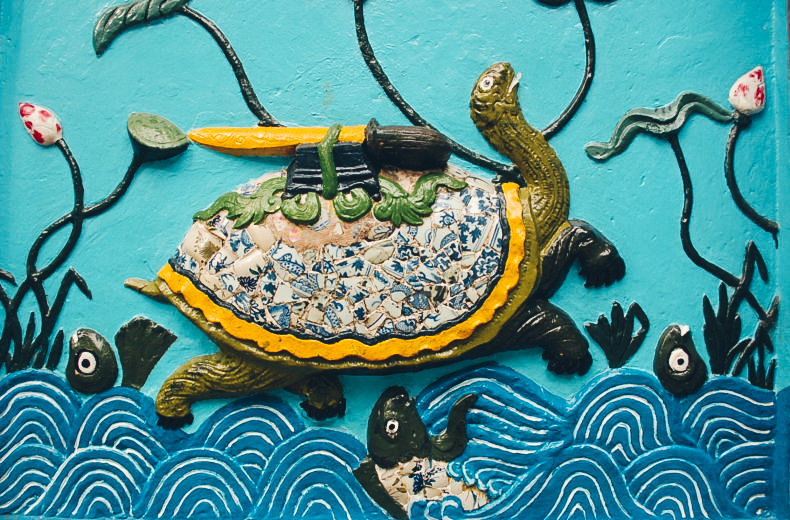 So finding a new one there is great news, considering the most famous Vietnamese turtle – a Yangtze soft-shell turtle named Cu Rua, or Great-Grandfather Turtle – broke the nation’s heart by up-and-dying in 2016. He weighed 400 pounds and lived over 100 years (one local scientist swore he passed his 700th birthday). Notably, he left behind no kin, but – the story goes – one very special sword. In the early 1400s, Cu Rua gifted a magic sword to the (real) Vietnamese leader Le Loi to fight off Chinese forces. After the Chinese retreated, Le Loi took a celebratory boat ride across a Hanoi lake, when the turtle appeared, said a few words, snatched back the sword, and submerged in the murky green waters. This is Hoan Kiem Lake, or “Lake of the Reclaimed Sword,” a beloved spot rimmed by willow trees and cute temples. The towering temple on a tiny island in the lake? It’s Turtle Tower. MO/AD is happy to christen all four of the world’s giant Yangtze soft-shell turtles (there are two known others in China) as October’s “cute animal of the month” – even if they aren’t terribly cute. We should know. Few locals ever saw Cu Rua, but our managing editor Robert Reid managed to. A decade ago in Hanoi, he heard a gasp by the lake, and saw a couple dozens pointing to the water – soon bubbles appeared… then one, very large, rather ugly, green head whistled over the surface and disappeared. The sword was out of sight. When you’re in Hanoi, be sure to go to the lake. And look for turtles. (Hey here’s an idea – join Modern Adventure in Vietnam next March).